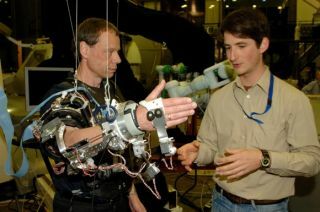 Astronaut Christer Fuglesang works with an exoskeleton device in the European Space Agency's robotics lab. When human space travelers arrive above an alien world, it's likely that they would send down the robotic explorers first. Now astronauts aboard the International Space Station can remotely control rovers and androids on Earth as practice for future missions to the moon, Mars and asteroids. The European Space Agency (ESA) has created a four-wheel rover with two arms, called Eurobot, as a pioneer test subject for remote control by humans in space. The space station crew will try to operate Eurobot from more than 200 miles above the Earth with a computer that has special screens and a joystick. "The Space Station is the perfect orbital platform to simulate very realistic scenarios for human exploration," said Kim Nergaard, ESA's coordinator for the Multi-purpose End-To-End Robotic Operations Network (Meteron) program. But that's just the first step. The next phase may see astronauts interacting with robots by wearing exoskeleton arms and gloves to control robot arms as though they were their own. An array of sensors and force-feedback devices could even give astronauts a sense of force and touch. "With these senses, the astronauts will have a real feeling of the forces that the arms of the robots are experiencing in their environment," said Andre Schiele, head of ESA's Telerobotics & Haptics Laboratory. One such robot, an android called Justin, is under development at the German Aerospace Center (DLR). It could undergo human puppeteer tests within two or three years, perhaps moving human-robot space exploration closer to something resembling a cyborg relationship.